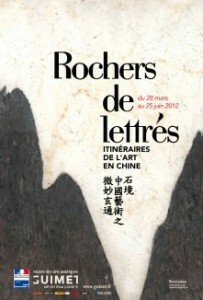 In the Guimet museum, “Scholar rocks”, at the hart of Chinese culture. You can visit until June 25, at the Guimet Museum in Paris, a beautiful exhibition on Chinese scholars, “scholar rocks” and the objects which make up their “treasures”. Unlike in the West, stones more than plants play a vital role in Chinese gardens. The rugged and monumental rocks, as from the seventh century, will begin to enter the studios of scholars in a reduced size and installed on pedestals of precious wood. The vogue of “scholar rocks” will persist until today and become one of the essential elements of the scholar’s style. The first gardens were in fact large imperial parks.As from the Tang Dynasty (618-907), private gardens become more common among senior officials, aristocrats and literati artists and their essential elements are water and mountains, which can be suggested by standing stones. She recalled these elements recently at a conference at the museum, as part of the cycle “The nature of scholars” prepared by its artistic director, Hubert Laot. The episode of Mi Fu (1051-1107), painter, poet, calligrapher, collector, is characteristic: in ceremonial robes, he prostrates himself before a rock and calls him “big brother rock”; it will cost him his job as a governor. The rock becomes the symbol of the rectitude of the scholar who will not accept many concessions. One may regret the absence of ink sticks, which are works of art and perhaps a few more comments. Reference may be made on the subject to a superb book by Lucien X. Polastron, “The Treasures of Scholars” (Imprimerie Nationale, 2010). 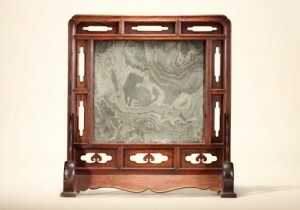 One can also admire a display of Huanghuali wood around a stone plaque with a figure of heavenly dog. But Dali marble, these “dream stones”, in a screen or as part of furniture, are not very present while they continue to be cut and collected today. The furniture of the scholar studio is quite remarkable even if one may prefer the classic Ming furniture as exhibited in the Shanghai Museum. Sizes and shapes of the “scholar rocks” are many and can be sorted by origine. 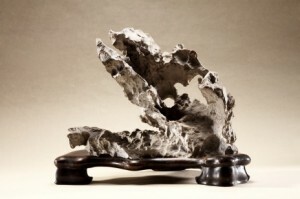 Lingbi stones (of Anhui Province), very popular, with natural shapes, are neither cut nor trimmed; hard, they produce a metallic sound. 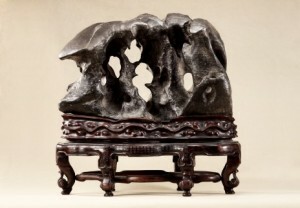 Lake Tai stones are mainly used in gardens, recovered or aged in the lake, they are wrinkled, perforated, “transparent” and give an impression of lightness. Ying stones from the provinces of Guangdong and Guangxi are also famous. The scholars are usually officials who passed the imperial examinations and it is they who have theorized the practice of the arts: writing, music, painting, poetry. Apart from these four arts, there is no aesthetic theory. Scholar stones and rocks are vested with the same qualities and meet the mountains and caves the entrances of which are often surrounded by inscriptions carved in stone. Mountains and rocks are in fact the creative force in the world. The original chaos is simple and crude. The aesthetics of what is natural, the refusal of artifice,are of interest to the scholar; the bizarre and sometimes the ugly are privileged, beauty is often regarded as ornamental. PS: The exhibition at the Guimet museum is now closed, but if you visit Paris, you will be able to see beautiful “scholar rocks” presented by Luohan Gallery, 21 Quai Malaquais, 75006 Paris (luohan@galerie-luohan.fr). Laurent Colson has a deep understanding of this art. More than ten years ago, he already presented major pieces and a very interesting catalogue “Evadé au pays des pierres”.